Fricassee. It’s a fun word to say, but what does it actually mean? Well a fricassee is a dish that’s halfway between a saute and a stew. This one just happens to be served with from-scratch dumplings. It is good, soul-satisfying comfort food. Perfect for bad days, cold days or anytime you need a bit of home and Mom’s cooking. My youngest son devours this dish, especially the dumplings. If you’ve never made dumplings before, don’t fret, they really are easy to make. Don’t overwork the dough, mix until just combined. I often serve this on a plate but if you have pasta bowls serve the chicken and dumplings in those beautiful bowls. Melt butter in a Dutch oven over medium high heat. Cook chicken in butter 15 to 20 minutes or until brown on all sides. Drain butter from Dutch oven. Return chicken to Dutch oven. Stir water, carrots, onion and salt into chicken. Heat to boiling; reduce heat. Cover and simmer 40 to 50 minutes or until chicken is no longer pick when centers of thickest pieces are cut. Prepare parsley dumplings. Remove chicken and keep warm. Mix flour, milk and pepper until smooth; pour into Dutch oven. Heat to boiling, stirring constantly. Boil and stir 1 minute and then reduce heat. Return chicken to Dutch oven. Drop dumplings by rounded tablespoonfuls onto hot chicken. Do not drop directly into liquid. Cover tightly and cook 12 to 14 minutes or until dumplings are fluffy and dry on top. Serve hot! Mix flour, parsley, baking powder and salt in medium bowl. Cut in butter, using pastry blender, until mixture looks like fine crumbs. Stir in milk until all flour is moist. 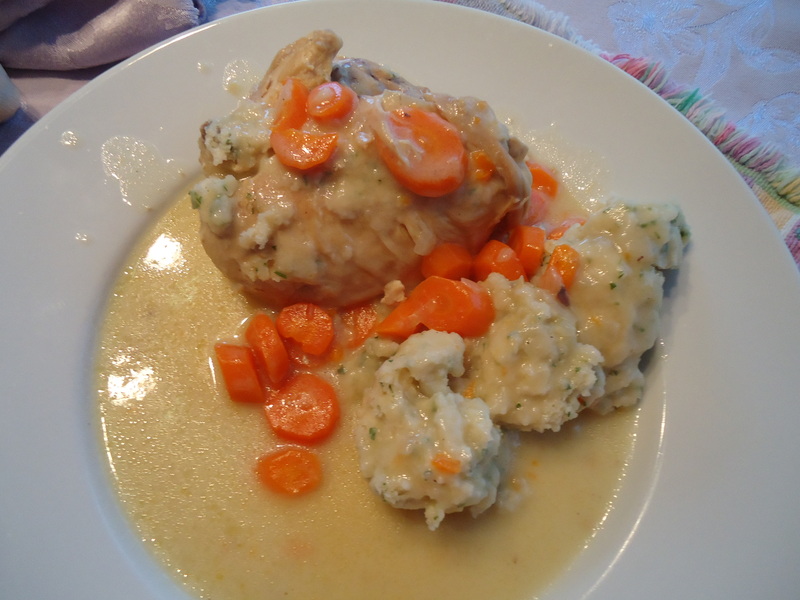 This entry was posted in Chicken, Comfort Food, Company Worthy, Entertaining, Entrees and tagged chicken, chicken and dumplings, chicken fricassee, chicken with vegetables, Comfort Food, dumplings, fricassee. Bookmark the permalink.